Starting one week today (Monday, January 6th 2014) I plan to return to eating World War Two British rations for one month. As before I’ll be adding in tidbits about the war, while Anne (my aunt) will once again add her own recollections of living in Scotland during that conflict. To get my mind in the right headspace, I’ve recently been watching a few WW2 documentaries and dramas. A Wartime Farm Christmas, a documentary which can be found on Youtube, is a wonderful antidote to the excesses of our 21st Century festive season and a great tribute to the resilience of those wartime civilians. I took in a show at Lunchbox Theatre here in Calgary yesterday. It’s playing until November 16th at Lunchbox Theatre, and if you’ve an interest in the Albertan experience during World War Two it’s worth catching before it ends. Between December 1939 and March 1945, 107 schools in Canada trained over 130,000 graduates for the RAF and RCAF through the British Commonwealth Air Training Plan. 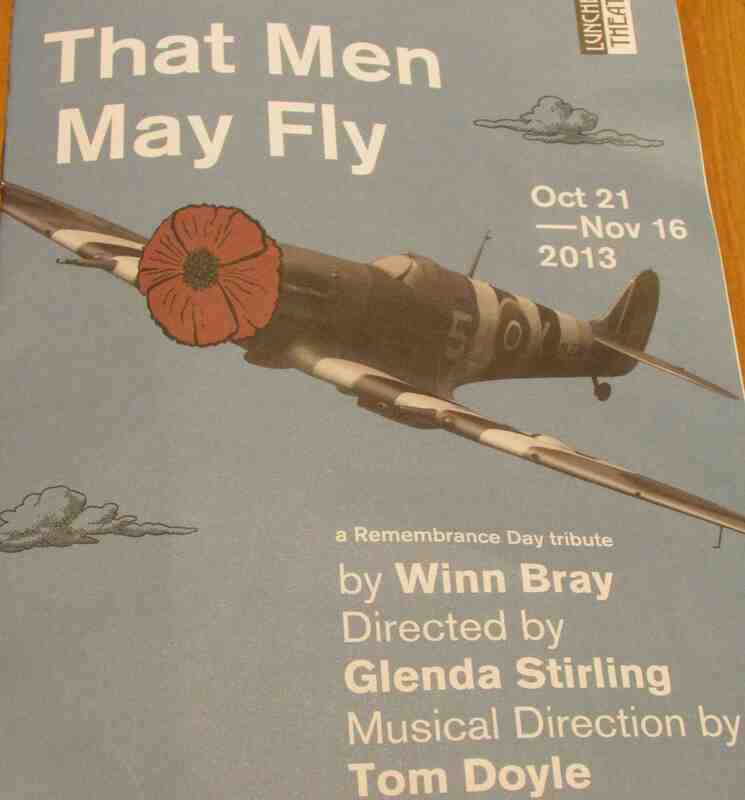 That Men May Fly, written by Winn Bray, tells the story of two of those airmen and a female mechanic stationed in Fort MacLeod, in Alberta. If you would like to learn more about the BCATP, it’s worth checking out the Canadian film For The Moment, starring Russell Crowe. At one point, he recites the poem High Flight, which was written by John Gillespie Magee, a young American who flew with the Royal Canadian Air Force and was killed at the age of 19, flying over England in 1941. But what of Elsie Inglis? What was her story? Born in India in 1864 to supportive, liberal Scottish parents, Elsie Inglis attended the newly founded Edinburgh School of Medicine for Women, before completing her training at the Glasgow Royal Infirmary. After working at Elizabeth Garrett Anderson’s ‘New Hospital for Women’ in London, and a maternity hospital in Dublin, she returned to Edinburgh where she opened a medical practice. An active suffragist, she was horrified by the lack of medical care available to women, and opened a maternity hospital and midwifery centre in 1894. Undaunted she approached the French who were much more sympathetic. Funded by the Women’s Suffrage Movement, these all female staffed hospitals sent teams to France, Serbia, Salonika, Romania, Malta and Corsica. Captured in Serbia in 1915, Elsie Inglis was repatriated to the UK where she then created and led a new team to set up a Scottish Women’s Hospital in Russia. When Elsie Inglis died of cancer in 1917, Winston Churchill said of her, ‘Inglis and her nurses will shine in history‘. In July 1925, the Elsie Inglis Memorial Maternity Hospital opened in Edinburgh with 20 beds. When it closed in 1988, it had expanded to provide 82 beds. The Clydesdale Bank honoured Dr Elsie Inglis and her work by putting her likeness on their 50 pound bank note in 2002. My husband wasn’t exactly thrilled at the idea when I asked him to join me in my second week of eating wartime rations, but give him credit, he’s agreed to play along. It helped, I think, that I told him he could ‘pretend to eat at the Savoy’ every lunchtime when he was at work and rationing would be limited to meals at home. Still, he was a bit anxious when he walked through the door this evening to discover what his rations would be. 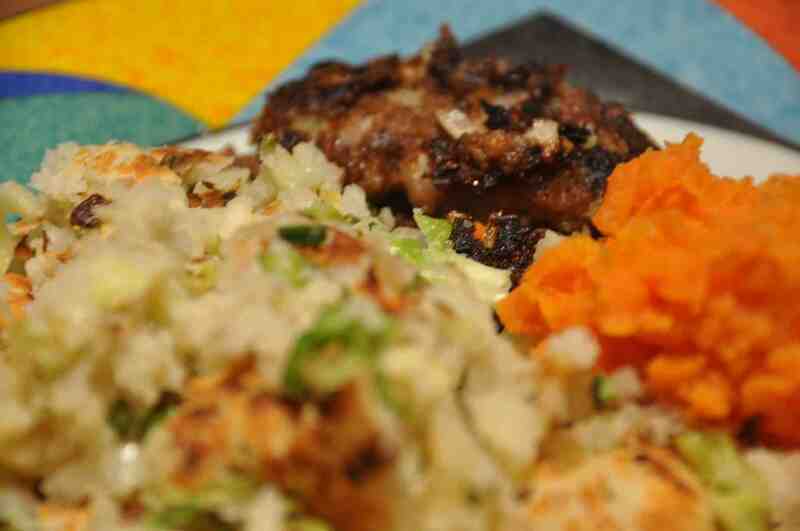 Homemade burger, bubble and squeak, mashed carrots, followed by apple crumble. When I did my food shopping for the week this morning, I discovered two things: 1) my bill was a fraction of the usual weekly cost. 2) I only shopped the ‘perimeter’, which is the healthiest way to shop. The one thing that put my bill up was the meat for one of my dogs. He’s very elderly (15) and reluctant to eat anything now unless it’s homemade. (He’s eating the equivalent of all my meat rations – and then some – in one day!) It got me to wondering what happened to pets during the war. When I did some research, it made for some very sobering reading. Over four hundred thousand dogs and cats were euthanized in the first few days of World War 2. Humans aren’t the only ones to make sacrifices during wartime. 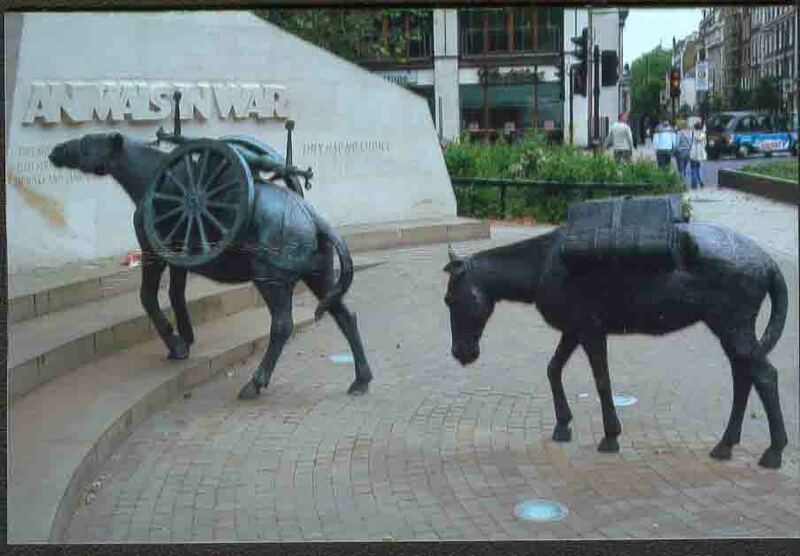 If you’re ever in London, check out the Animal War Memorial in Park Lane close to the junction of Oxford Street and Bayswater Road. It’s a very moving tribute to those proud, beautiful animals. Restaurants were still open and supplied meals, but the plates were not well filled and if you didn’t get there early you would find most things scored off the menu, and were left with some sort of ‘savoury pie’ of mixed veg and herbs with a few breadcrumbs scattered over the top. Then there were the ‘British Restaurants’ set up by the Ministry of Food; I never ate in one but the word went round that the meals were barely acceptable. Fish & Chip shops got a quota of fish and queues formed well before they opened; after it had been sold there were only a few sausages (mostly of bread) or meat-or-fish-cakes of dubious content. After that it was chips with nothing. The shops sometimes didn’t open at all – days when there was no fish on the market. Fishing could only be done in near coastal waters and they didn’t always manage to catch anything. I was still at school in 1939 and when I was evacuated the school was many miles away so I had to eat in the school canteen – not very inspiring. I can remember macaroni cheese without much cheese and being many times faced with a plateful of mash alongside a small piece of Cheddar and some over-boiled cabbage, often followed by semolina with a dab of jam in the middle. But we ate it all. You know that horrible feeling when you sleep through your alarm and spend the next few hours trying to play catch up? Welcome to my day. Here’s the thing… I’ve been planning on starting a blog for a while. I’m going to be publishing a series of books this autumn, and with that comes the requirement for a website. A friend recommended it might be better to get the whole website/blog thing figured out beforehand so I can then concentrate on my writing. Flash forward to today. The perfect time, I decide, to start pulling my website together. I’ll put in a few photos, a little bit of text, and then over the next week I can pull together a couple of blog topics before I push the ‘live’ button. How was I supposed to know it went live as soon as you sign up? They only had three TV channels when I was growing up! So here I am, scrambling to introduce myself and this blog. What’s it going to be about? Three of my passions; the craft of writing, travelling and the history of the Second World War. If you enjoy these topics, I hope you will join in the conversation.